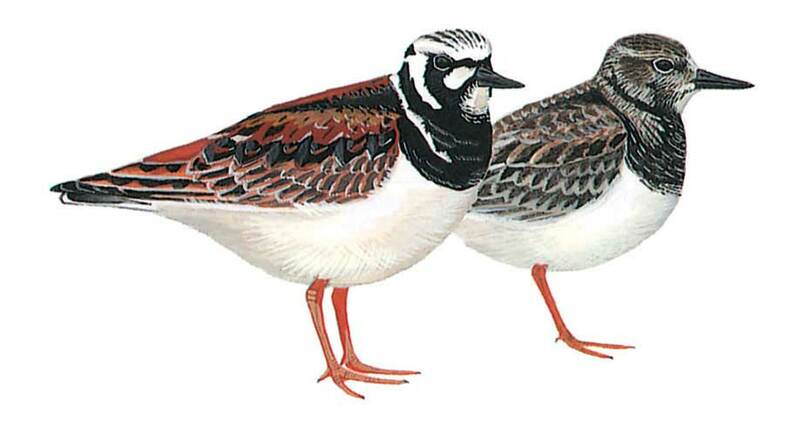 A medium-sized, stocky, short-billed and short-legged wader; easily distinguished in breeding plumage by striking head and breast markings, chestnut shoulder-patch and wing-coverts, and bright orange legs. Flight is strong and direct and shows distinctive pied and chestnut appearance, black breast is a striking feature. In winter and juvenile plumage, head and neck are much darker, and usually lack chestnut; also juvenile shows bold buffish fringes on most coverts. Walks with a rolling gait, and turns over small stones and seaweed for food items underneath.